California has been in severe drought in recent years and there has been little to no snow on many California mountains. Those of us who live here feel it in the air. 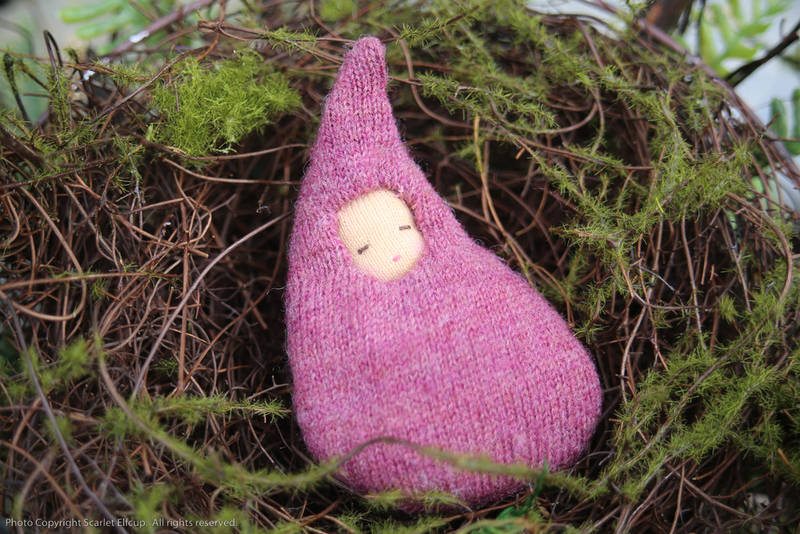 This was the inspiration behind Scarlet Elfcup's first creation, The Rainbaby. These Rainbabies are amongst hundreds and thousands of Rainbabies still in hibernation...in a deep deep slumber they sleep. When will they rise and shine to shower California with much needed water? Sweet little slumbering ones, they are. Handmade from re-purposed 100% cashmere and wool and stuffed with clean carded wool. The doll skin is made of 100% cotton interlock knit. The facial features are made with cotton embroidery floss. They are about 3.5" tall and 2.5" wide. These Rainbabies are intended for baby shower favors. Order in bulk and have them delivered with each baby pre-packaged in a handmade muslin bag. Other ideas: Give someone a Rainbaby as a gift. Give your little ones a Rainbaby to carry around in their pocket. Or hang the Rainbaby as an ornament for any holiday, any time of the year. These Rainbabies are now available for purchase in the Etsy Shop. IMPORTANT NOTE: The small and delicate parts on this Rainbaby are not suited for children under the age of three.